Yerevan's Republic Square, from above. Yerevan - city view from Cascade with Mount Ararat in the background. Yerevan ("Երևան" in Armenian; former names include Erivan and ancient name Erebuni; sometimes mistakenly written in Russian transliteration as Erevan) (population: 1,201,539 (1989 census); 1,088,300 (2004 estimate) is the largest city and capital of Armenia. It is situated along the Hrazdan River, which is not navigable, on the Ararat Plain. Yerevan is a leading industrial, cultural, and scientific centre in the Caucasus region. It is also at the heart of an extensive rail network and is a major trading centre for agricultural products. In addition, industries in the city produce metals, machine tools, electrical equipment, chemicals, textiles, and food products. Educational and cultural facilities in Yerevan include universities, the Armenian Academy of Sciences, a state museum, and several libraries. The largest repository of Armenian manuscripts, and indeed one of the biggest repositories of manuscripts in the world, is the Matenadaran. Zvartnots International Airport serves Yerevan. Armenian Navy Band concert at Cascade. Swan Lake by the Opera. The layout of Yerevan was designed by Alexander Tamanyan in the 1920's, and has grown way beyond his projections of a couple of hundred thousand residents. The center however remains pretty close to what he envisioned, with a grid pattern of streets intersected by some circular roads and a lot of parks. Virtually all hotels, museums, government offices, clubs and the like are in the very center (see map below), which can be walked across in 20 minutes - making Yerevan an extremely walkable city, except for the drivers. In the summer and fall, central Yerevan can feel like one big café, with the Opera area being their capital. It remains light out until late, people are out drinking surj (Armenian coffee) and freshes (fruit smoothies), eating pastries and crepes. The days can be hot, so the nights are perfect for sitting out. In the winter it is much quieter out, yet the many teahouses across downtown Yerevan are quite packed as well as downtown's main outdoor winter attraction - ice-skating by the Opera, which opened in December 2005. Spring is beautiful, with short showers and lots of greenery. In Novemeber 2007, the pedestrian street Northern Avenue opened, linking the Opera to Republic Square. These being the two focal points of life in the city will make for a lively street. Along with the Northern Avenue, some of the hipper streets are Abovian Street, Tumanian Street, Sayat Nova Street, Terian Street, Mashtots Street, and Amiryan Street. For those that live outside of the small center, public transport is cheap and easy, with Yertughayin Taxis (fixed route vans also referred to as marshrutkas or marshrutnis) bringing people to the center from all over, and the not-so-extensive metro also serving parts of Yerevan. Most of the cities popular shukas (bazaars) are outside of the center - such as the Hrazdan, Bangladesh and Goom shukas. For locals in Yerevan - who like the rest of the republic have seen a sharp drop in living standards since the collapse of the USSR, the problem is not so much unemployment (as is the case in other parts of Armenia) as it is simply underpay and underemployment. People are working, but in jobs well below their capacity and/or for what most would not consider a living wage. Like much of the rest of Armenia, people depend to a great extent on remittances - money sent back home by relatives - and on foreign aid from governments and the Armenian Diaspora. See the Live in Armenia article for information on moving to Armenia. Archaeological evidence indicates that a military fortress called Erebuni (Էրեբունի) stood on Yerevan's site as far back as the 8th century BC. Since then the site has been strategically important as a crossroads for the caravan routes passing between Europe and India. It has been called Yerevan since at least the 7th century A.D., when it was the capital of Armenia under Persian rule. Due to its strategic significance, Yerevan was constantly fought over and it passed back and forth between the dominion of Persia and the Ottomans for centuries. In 1827 it was taken by Russia and formally ceded by the Persians in 1828. After the 1917 Russian revolution it enjoyed three years as the capital of independent Armenia, and in 1920 became the capital of the newly formed Armenian Soviet Socialist Republic, a territory of the Soviet Union. With the collapse of the Soviet Union, Yerevan became the capital of the independent Republic of Armenia in 1991. Armenia was for most of its history a rural society, with few cities of its own. The modern city of Yerevan was built on tragedy and dreams. Little more than a garrison town of mud-brick and gardens before its first brief experience as capital of an independent Armenia in 1918, the city burgeoned under Soviet rule. The flood of refugees from the 1915 holocaust and its aftermath fueled an uneasy but productive alliance between Armenian nationalism and Soviet hopes of spreading the Communist gospel through the Armenian Diaspora. Modern Yerevan was built, deliberately, to be the universal center and pole of attraction for the diaspora, with an educational and cultural infrastructure far out of proportion to the size or intrinsic wealth of Soviet Armenia. In 1988, when the collapse of the Soviet Union became visible, Yerevan was a full-fledged, booming Soviet city of over 1 million people. A gracious street plan of parks, ring-roads, and tree-lined avenues had been laid out by the architect Alexander Tamanyan and his successors in the 1920s and 1930s for a population they dreamed might reach 200,000. That goal long surpassed, the process of expansion to reach the magic million-person threshold that qualified Yerevan for a metro and the other perquisites of a city of all-Union importance involved Armenia's successive First Secretaries in sordid expedients and half-finished, earthquake-vulnerable construction projects in sprawled, depressing suburbs. The success of the 1988 independence movement dealt the city a series of major shocks, first with the forced emigration of a centuries-old Muslim (mostly Azerbaijani Turkish) population, and its replacement by newly impoverished refugees from Baku. The disastrous collapse of the Soviet economic system (Armenia made high-tech pieces of everything, but produced all of practically nothing) triggered the economic migration of hundreds of thousands of impoverished Armenians bound for the bright lights of Moscow or Glendale, California. A reliable census took place in 2001, counting just over 3 million heads in the country. The city of Yerevan preserves little of its early history in a form of interest to casual visitors. Behind the anonymous Soviet facades, however, a rich and complex life took place and still does, in the bak (courtyard) or in private apartments far better furnished -- with books, musical instruments, art, and hospitality - than 70 years of official culture or a decade of grim poverty would suggest. The city of Yerevan is itself a Marz (province) of Armenia. The Mayor of Yerevan is appointed by the President of Armenia. The city is divided into different communities (Համայնք) which are subdivided into neighborhoods (Թաղամաս). The following is a list of all of the communities, and some of the better known neighborhoods. 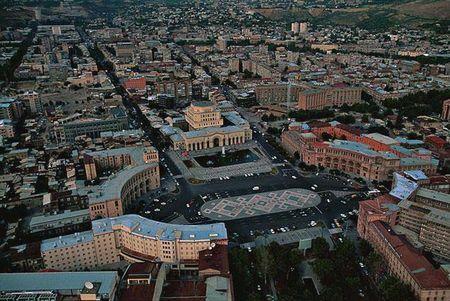 The city of Yerevan is 210 square kilometres (82 square miles) in size. Yerevan is located at 40°11' North, 44°44' East. Yerevan has a decidedly continental climate. Though it is at the same latitude as warm Mediterranean countries like Portugal, the 1km elevation and the distance from the sea means that the summers are very hot (sometimes reaching over 40 celsius in the summer), the winters very cold, and the humidity very low year-round. Yerevan is served by two principal airports: Erebuni Airport, which is east of Yerevan and almost unused, and Zvartnots International Airport (code EVN), 15 km west, which is used by nearly everyone arriving from abroad. Yerevan is lightly covered by a (so far) one-line metro system, the Metro, as well as by a large number of bus lines and a massive number of Yertughayin Taxis, the primary form of public transportation. This interconnects with the national train lines. The Yertughayin Taxi is a van which drives along numbered routes, which cover the entire city quite well. The city is the hub of Armenia's highway network. Traffic in Yerevan flows poorly, with corrupt police having a negative rather than positive impact on flows, and countless Yertughayin Taxis weaving dangerously and stopping suddenly in traffic. Tsitsernakaberd - the monument commemorating the victims of the Armenian Genocide. It is located at the top of Tsitsernakaberd Park, where you could also find the Genocide Museum. Cascade - the massive white steps that ascend from downtown Yerevan towards Haghtanak Park (Victory Park). The Cafesjian Museum of Contemporary Art will be located at the top of Cascade (under construction, will open in 2010). Mayr Hayastan - the Mother Armenia statue located in Haghtanak Park (Victory Park) and overlooking downtown Yerevan. Underneath the statue is the Mother Armenia Museum of the Ministry of Defense, and next to the statue is an amusement park. Opera - Aram Khachaturian Concert Hall & the Alexander Spendiaryan Opera and Ballet National Academic Theatre. Two grand halls that host the Philharmonic Orchestra, various Armenian folk dance ensembles, choirs, operas, ballets, and more. Sasuntsi Davit Statue - David of Sasun, an epic Armenian folk hero. Ararat Brandy Factory - tours to see the production facilities and taste the company's various brandies. Pantheon - cemetary where many famous Armenians are buried. Hamalir - Sports and Concert complex. Yerevan's answer to the Sydney Operahouse. Hosts various concerts and conferences. Sergei Parajanov House-Museum - a true pleasure, with its eclectic mix of objects which only someone like Parajanov could produce. Matenadaran - one of the world's largest repositories of ancient manuscripts. Republic Square - spectacular fountain shows in the evenings from 21:00 to midnight. Vernissage Market - 'the' place to shop for souvenirs. Abovian Street - 'the' street back in the day. Proshyan Street - also known as "Barbeque Street". Northern Avenue - pedestrian boulevard which cuts right through the heart of the center of the city, from Opera to Republic Square. Haghtanak Park (Victory Park) - great place to relax one afternoon (if the temperature isn't too hot!). It's also where the Mayr Hayastan statue stands. Djrashkharh (Waterworld) - big indoor/outdoor waterpark on the outskirts of the city center. Play City - paintball, bowling, catapult, go karting and much more on the outskirts of the city center. Yerevan Zoo - zoological park on the outskirts of the city center. Haghtanak Bridge (Victory Bridge) - crossing the Hrazdan Gorge from the Brandy Factory to the Wine Factory. Hrazdan Gorge - numerous restaurants by the river, and a working mini-train. Kond - neighborhood of mud and stone homes, narrow winding alleys, reminescent of the poorer parts of Yerevan before Sovietization. 1988 - Millions defy Soviet bans and demonstrate for the union of Armenia and Karabakh. This page was last edited on 15 October 2018, at 05:42.